Truman’s Ridge was organized in 2008 when Steve and Bruce, already playing in a local bluegrass jam band, decided to branch out and do something a tad different. Having a guitar and banjo, they were thrilled when Mark jumped on board with his mandolin. Doris, an upright bass player known by nearly every bluegrass aficionado in the area, had always told Steve she would play bass with him in a band if he ever started one. For years, she had encouraged Steve put himself out front. The band was together. They decided to dress up with Fedora hats and colorful ties. They practiced to bring in the sound of the mid-western string bands as well as some jazz and swing mixed in. They blended folk and gospel as well, with a touch of Americana, rock and blues. They decided to play bluegrass with Chicago style. As the band discussed various possibilities, the conversation turned to the bass Doris played. She had a habit of naming her basses and this one was named Truman. She told the guys that she had discovered when she purchased the bass that it has been played at the 1944 Democratic National Convention in Chicago when Harry Truman was chosen to be the next Democratic Presidential candidate. That was tossed around for a bit. Then the magic happened. The fact was brought up that Bruce’s father was raised in Crawley’s Ridge, Arkansas. “How about Truman’s Ridge?” someone asked. They googled the name and could not find it anywhere. That was a good sign! Suddenly, Truman’s Ridge was born. The years passed, Doris, God rest her soul, passed away. There were interim bass players throughout the years, until Bruce asked his neighbor, Chris, an electric bass player, to try out his electric upright, a smaller and skinnier version of a full size upright bass. That worked until the electric part decided to quit working, thus producing no sound. He dragged in his full size upright bass and Chris was able to play that and eventually bought it from Bruce. He informed her that this bass also originally belonged to Doris, along with another bass named Bess, for Truman’s wife. Becoming a full time member of the band, the bass that Chris now owns and plays, Doris named Maggie…for the Truman’s daughter. Truman’s Ridge has evolved since 2008. Mark has moved on to a well known Country Rock band and Wes and Charley have come on board. Things change – but Truman’s Ridge, who have played from Kansas City to Nashville, 4 CDs later, represents a band with many friends and followers. 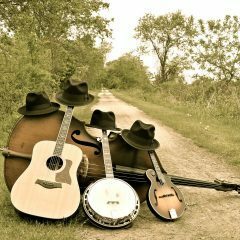 A band that still plays bluegrass, Chicago style! This entry was posted in Uncategorized on November 17, 2018 by Truman's Ridge.